Content strategy has been around for a long time. Large corporations such as Disney, Wells Fargo, and Mayo Clinic have had functional content strategy teams for years. The mega-agency Razorfish has had dedicated content strategists on staff since 1998. But it's really only been in the last two years that the larger UX community has started paying closer attention to content strategy. In 2008, not a single UX conference had a session or workshop devoted to content strategy; In 2010, nearly all of them did, including the IA Summit, UX Week, UX London, User Interface Conference, and even SXSW. Why the gold rush? The answer is pretty simple: it's inherently impossible to design a great user experience for bad content. If you're passionate about creating better user experiences, you can't help but care about delivering useful, usable, engaging content. Today, the sudden surge of interest in content strategy has stirred hope in even the most jaded UX souls. Here's an entire population of professionals who are ready and willing to tackle even the most complex content problems! But before UX and content strategy walk hand-in-hand off into the sunset, we should consider a little marriage counseling. Do these two really belong together? For me, the easiest way to describe content strategy is this: content strategy plans for the creation, delivery, and governance of useful, usable content. I've been using that definition for a while now, and it seems to help people understand the concept pretty quickly. It certainly isn't the only way to look at it, though; for an expanded discussion on the topic, visit the content strategy Google Knol. Core strategy defines how your content will help you meet business objectives. Substance identifies what content is required to successfully execute implement your core strategy, including characteristics such as messaging architecture, intended audience(s), and voice and tone. Structure focuses on how content is prioritized, organized, and acessed. Although structure can include information architecture (IA), it focuses more deeply on the content itself, including mapping messages to content, content bridging, and creating detailed page tables. Workflow explains how people manage and maintain content on a daily basis, including the roles, tasks, and tools required throughout the content lifecycle. Governance describes the policies, standards, and guidelines that apply to content and its lifecycle, as well as how an organization will sustain and evolve its content strategy. There are aspects of substance and structure that have traditionally been the domain of information architects, and that still holds true. As Louis Rosenfeld has said, "If [information architecture] is the spatial side of information, I see content strategy as the temporal side of the same coin." Both must consider things such as current state content, taxonomies, content models, cross-platform requirements, and so on. But an IA is rarely responsible for editorial, workflow, or governance components of content planning and development. For UX teams, these are the areas that, when overlooked, tend to blow up project timelines and compromise content quality. So, Is Content Strategy a Part of UX Strategy? Technically? No, not really. While workflow and governance have direct impact on the end content product, they don't (and can't) live exclusively within the domain of UX. But substance, structure, workflow, and governance typically inform one another, which is where the content strategist can really make a difference. They can act as a UX advocates to content creators, while keeping designers in "the real world" when it comes to things like content requirements and template designs. Maybe it's easier to answer the question like this: not every content strategy needs UX strategy, and not every UX strategy needs content strategy. Yes, they're both required for the effective execution of just about any initiative that requires or specifies the need for content creation, delivery, or management. But that doesn't mean we need to cram content strategy into every UX project plan, because sometimes, it's clearly unnecessary. For example, a lightweight application redesign likely doesn't require a content strategist, although it probably could benefit from a smart copywriter familiar with usability principles. On the flip side, a content strategy project that focuses largely on content workflow and governance likely won't need to pull in a UX strategist, but might need a good interaction designer to assist with workflow documentation. It follows, then, that a content strategist doesn't always report to a UX strategist, and vice versa. On a large-scale project that involves a lot of complex content initiatives, a lead content strategist may oversee a larger team that includes UX practitioners. On a full website redesign, a UX strategist may lead a team that includes a content strategist who's (either partially or fully) responsible for anything related to the creation, delivery, and governance of the site content. A side note: do I really care about who owns what and where things fall on either side of the wall? Emphatically, no, I don't; debates that smack of territorialism make me insane. Roles, activities, and artifacts shouldn't "belong" to one discipline or another. What's important is that we are all able to talk about shared principles; this is where the foundation for our collaboration truly lies. Pragmatically speaking, there are multiple interdependencies between those roles, activities, and artifacts of UX pros and content strategists. These interdependencies and commonalities demand that we work together to deliver the high quality content our users want and deserve. How Does Content Strategy Relate to UX Design? For a practical look at how content strategists contribute to a UX project, Erin Kissane's article, What Do Content Strategists Do? offers a description of her typical project activities. Also, Karen McGrane's stellar presentation, Why UX Needs Content Strategy, examines in detail the activities and deliverables a content strategist can contribute to a UX project. Is Content Strategy Just the Latest Trend? Sometimes in posts on Twitter or in blogs, I come across comments about content strategy like these: "I do all this stuff already. No way will my clients pay for any of this. Content strategy is just a trend. 'Content strategist' is just a title writers assume to get paid more money." I'm not sure what to tell people who get defensive when I talk about content strategy. Beautiful designs are constantly obliterated by bad content. Content delay syndrome is an epidemic. We all deal with nonstop complaints (sometimes our own!) about poor quality content on our website, intranet, or application. Content strategy solves these problems before they even begin. It isn't a trend, and it's not a silver bullet. It's a long-term commitment to better content, a practice that beautifully complements the art and science of UX strategy. What Else Should UX Professionals Know About Content Strategy? Keep an eye out for the March 8 release of Erin Kissane's brilliant The Elements of Content Strategy from A Book Apart. 'Til then, make do with my book, Content Strategy for the Web. Read Andrew Maier's Complete Beginner's Guide to Content Strategy. Catch up on the conversation by reading Richard J. Ingram's terrific recap of his favorite content strategy articles of 2010. Attend (or start) a local content strategy Meetup. Come to Confab, a content strategy conference hosted by Brain Traffic this May in Minneapolis. Kristina Halvorson is the CEO and Founder of Brain Traffic a content strategy consultancy. She is the author of Content Strategy for the Web, the host of the 5by5 podcast Content Talks, and the founder of Confab: The Content Strategy Conference. She speaks about content strategy at conferences all over the world, and she is always happy to come home to St. Paul, Minnesota. She can be found on Twitter as @halvorson. 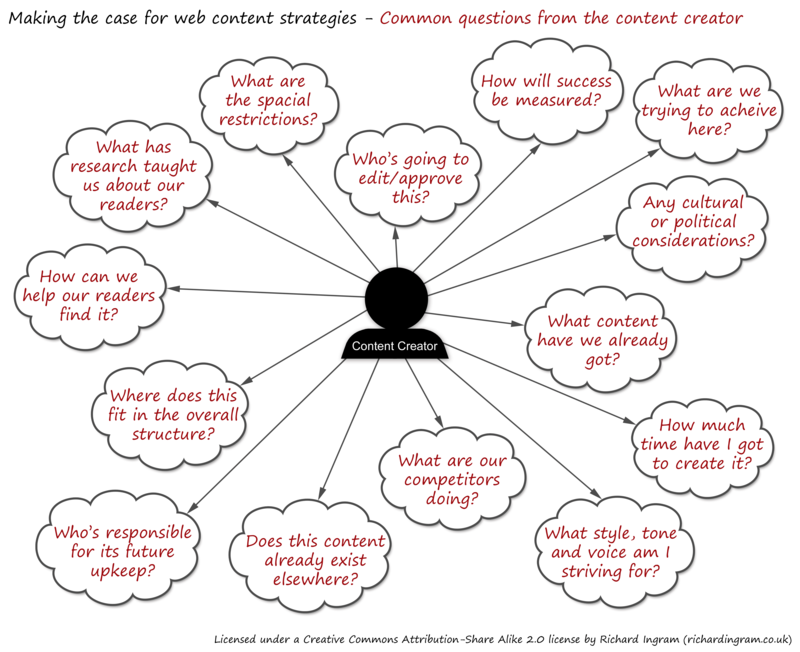 Regarding the graphic showing a content creator surrounded by questions. As a content creator I cover off all of these in a briefing meeting with the client and always have done. Reveiously as a print cpoywriter I did the same. Do we really need a separate content strategist to do that? A good web writer should expect to have to uncover the answers to these as part of any web writing job. It seems to me that most of the jobs a content strategist does are already being done. The problem has always been when it comes to paying to create good content. No amount of style guides and governance rules can make your content better. You still need to hire a good writer. Unfortunately, that is still the case even when clients are paying for "content strategy". It might be time to shift the focus. Today, the best content and UX strategy is one where I can ask for what I want/need and the website, mobile application, etc. understands my context and intent to deliver the exact right thing - without forcing me to sift through thousands of search results, click the right buttons, or needing to understand the company's jargon. Make this happen, with a virtual assistant and then content and UX strategy then becomes about conversations with customers, rather than layout and design. Fantastic article, I especially appreciated the graphs and illustrations. I like the fact that you establish content strategy is not only important, but that it's here to stay. Thank you for contributing such an informative article. Would you be able to expand on definitions of two terms you mention: "content bridging" and "messaging architecture"? I can only guess what they mean unfortunately. Thank you Kristina for your brilliant insight on the relationship between UX strategy and content strategy. This clarified some things for me! I love this line: " What's important is that we are all able to talk about shared principles; this is where the foundation for our collaboration truly lies." What I like about your approach to content strategy is that you always strike the fine line between inspiring idealism and practical insight. I am working on mobile project where we think of the content as the navigation - check apps like FlipBoard or Flud for approaches to navigation and user experience where content plays a critical role in the "user experience". I believe we'll see more of with rise of Tablets and tap interfaces. Thinking of content strategy as separate from "UX" seems like a misunderstanding of what User Experience is. Kristina knows this already but I think she's about the best spokesperson we've got for the Content Strategy discipline and community. Much of what she writes here -- and writes and says and gesticulates elsewhere -- aligns very closely to the Content Strategy practice at Walt Disney Parks and Resorts Online. We’ve been doing Content Strategy formally here for approaching 10 years, number close to 10 on the team, and are still growing. In fact, we’re aggressively recruiting for a couple of open positions as I write. If you’re interested, please drop me a line at max.greenhut@disney.com. Thanks for sharing, Kristina. I've always thought that UX design and content strategy were two peas in a pod. Now you've laid it out so eloquently that few can dare to disagree. This is a very clarifying article for many UX professionals. Should an UX person learn more about content strategy? Maybe it depends on the size of the organization she is working at; if she is a do-it-all UX professional she wont scape from learning more about this exciting topic. Thanks, all, for your kind comments. I'm glad this is striking a chord with our UX community! great post. yes to all. i've been doing ux/ia since y2k, after coming online as a content strategist in the mid 90s, being a producer / project manager in nyc for a while, then specializing in ia and ux. when you get to where you're going, there you are: in the dark years before the internet i was a newspaper and wire service reporter, so i came into it with those core skills. others bring design training, others bring tech skills. ux includes ia and content, and content and ia are part of ux. who owns what and wears which hats is very much situational. thnx for the great read. "Roles, activities, and artifacts shouldn't "belong" to one discipline or another. What's important is that we are all able to talk about shared principles; this is where the foundation for our collaboration truly lies." There's so much that is incredibly important in your article, but I latched on to this because in the end I think content strategy informs and reifies a set of best practices that cross multiple silos and titles. While I think the job title of "Content Strategist" is a welcome addition, in the end I'm more smitten by the understanding of the value that content strategy brings to the table. Great article. Although written primarily from a website point of view, it's just as important (if not more) in the mobile app building arena. The simple form factor difference of mobile devices may need content to be sliced and diced in different and flexible ways. Very few clients with have an understanding of how to leverage their content it across multiple channels and platforms. It's going to get even more messy. Consider content heavy companies that have text for print, video for television, mixed content for web, etc. Most likely they have some a unique content management system for each. Each will need to come together for delivery on devices like the iPad, which seems to be the digital convergence we have been waiting for. Great post. Content has always been at the heart of UX, but it's great to see these connections being deepened and clarified. At iQcontent, we've been doing content strategy since 2000. The challenge, traditionally, has been getting clients to value, and hence, pay for the work. But I think that's beginning to change now, and the result is better sites, better experiences, and better results for business. Great point and infographic. I'm now in my process to learn more about information architecture, so that user can read and scan the content more effectively. Enjoyed the love story Kristina. Great points. Content strategy has been around for quite some time, and I would add that the proliferation and portability of content in various channels has increased the need for it (or rather, the spotlight has never shown so brightly on sites without it – hello garbage pile). I recently read your book and wanted to thank you for taking the time to write it. I found it helpful in understanding how content folks might approach the process.